Pioneers in the industry, we offer electro permanent magnetic telescopic plate handling system, battery operated electro permanent magnetic lifter, epm electromagnetic lifter, magnetic fixed plate handling system, magnetic vertical and horizontal plate handling system and magnetic slab and block handling system from India. Electro Permanent Magnetic Lifter can also be made as per customers requirement the system could be easily be intregrated with PLC. Our organization has set benchmark in offering Magnetic Fixed Plate Handling System to our clients. Provided product has been made with powerful magnetic which has critical role to play in the functionality. Provided product is able to operate in hassle free manner and is preferred by our large customer segment throughout the country. This product is dispatched within stipulated time frame to our customers to meet demands. 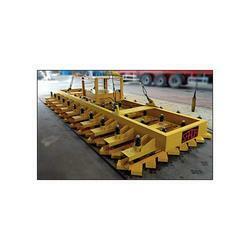 For loading/ unloading plates from Railway Wagons/ trucks. For storing in Plate yards. For feeding plates onto a flame/ plasma cutting machine table, one at a time. Can be used with EOT/ Gantry/ Mobile Cranes etc. Radio Remote Control – Operates from a convenient distance all the functions i.e, MAG/ DEMAG/ Inching functions. 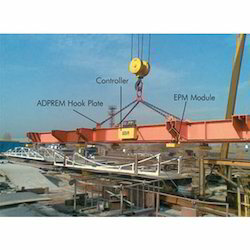 EPMs suspended from fixed length spreader beam so that the maximum range of plates are covered. Optimise the available work area by elimination of dunnage. Electronic control panel along with standby PCB card. 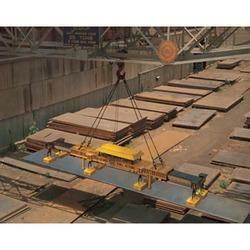 Double Mag Cycle - this ensures the safe lifting of the load. Magnets can be selectively switched according to the length of the plate being handled. Smaller Plates – Only internal magnets are switched ON. Larger Plates – All the magnets are switched ON. 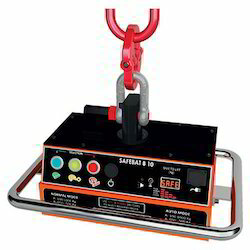 Safety Interlock Key – to Magnetize/ Demagnetize 2 buttons are to be pressed simultaneously. This eliminates the chance of accidental operation of the magnet. “Inching” feature –When the magnet is switched ON, it might lift more than a single plate. Inching is a feature, which when invoked reduces the magnetic power slowly such that additional plates, if lifted, are dropped. This is used to make sure that only one plate is handled at a time. ADPREM – Accidental Demagnetization Prevention Mechanism. Disable the demagnetization cycle when carrying load. Lamp Block – Displays the systems present state. Chain and Hanging Arrangement – made of grade 80 high strength steel along with bull ring. With aid of our industrious professionals we are offering Magnetic Vertical And Horizontal Plate Handling System to our clients. Reckoned for operating in hassle free manner, this product is available in latest technical specifications and other suitable options to our customers from across the country. It does not require much maintenance and preferred for its excellent working for long time period. 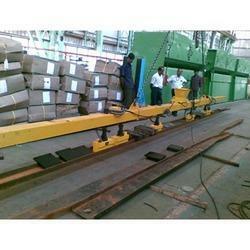 Magnetic Vertical And Horizontal Plate Handling System is available at reasonable price. Tilting Electro Permanent Magnets for handling Single plates in either vertical or horizontal position. “Inching” feature – drops additional plates making sure that only one plate is handled. Supplied along with fixed spreader beam. Simple self-tilting mechanism by appropriate positioning on plates lifted. No additional mechanism required. Horizontally placed plates can be stacked in vertical position or Vertically stacked plates can be kept in horizontal position by appropriate placement of the magnets. Spreader beam fitted with elastic suspension for EPMs/ control panel/ indicative tower lamp/ Chain & Bull Ring etc. From the first day of our inception, we have been able to manufacture the premium quality of Magnetic Slab and Block Handling System. Its high performance, low maintenance and better energy efficiency, makes this magnetic slab and block handling system highly demanded for plate handling purposes. 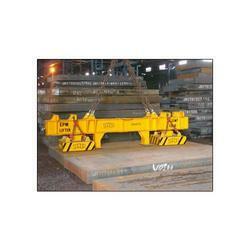 The offered magnetic slab and block handling system is designed as per the set industry norms. Our company is highly esteemed firm known for offering EPM Based Cutout Handling System to the clients. These products are manufactured using supreme quality basic material and pioneering techniques in tandem with industrial standards to attain complete customers satisfaction. EPM Based Cutout Handling System are stringently tested on certain parameters by our quality controllers to eradicate all kind of defect before delivering at clients' end. Use Magnet to load full plate on to the cutting machine. After cutting, unload the cut-outs and skeleton using the same magnet in 1 or 2 passes. Can be used with Flame Cutting/ Plasma Cutting/ Waterjet Cutting/ Laser Cutting machines. Stop using the cutting table as a sorting table. Cut more parts per shift by maximizing torch time. Lifted plate will not drop even during power failure. 30% more magnetic power given in transportation stage. Ensure that the magnet lists only one plate. No wooden dunnage is required between plates. 97% electrical power saving when compared to similar electromagnet. 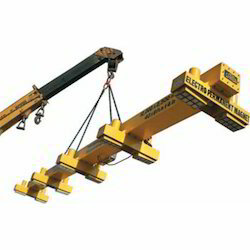 Optimised magnet and beam weight to get maximum lift with your crane. One man can load/ unload the plate/ cut-outs. Quick parts removal eliminates idle machine time. No need to use grabs and chains. Electro Permanent Magnets in module with mounting holes. Each magnet is completely sealed with no moving parts. Magnets with Safety factor of 3. Spring Suspension Box can be added to take care of waviness of plate. 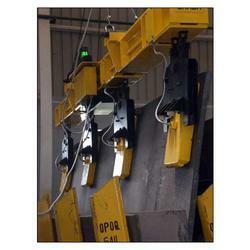 Looking for Magnetic Lifter For Plate Handling ?